What does a day of very low-carb eating look like? Bacon and eggs, chicken salad and then steak, blue cheese sauce and green beans?! Okay, some of the low-carb clichés work well. I don’t mind bacon and eggs in some form for breakfast every day. Otherwise, I might have low-carb bread (and you can see our great recipe for this here) with butter and Marmite, or I have smoked salmon or leftovers from the night before. Whisper it: I’m not fussed about steak. A great burger, on the other hand… I’m also keen on turkey, particularly turkey mince which is very versatile. Turkey tacos, turkey chilli, turkey burgers and turkey curry are regular features in my house. Two rashers of back bacon, chopped up and fried in a little egg. Once they have cooked, I add in one large egg and mix it up. The whole thing takes less than 10 minutes to make. 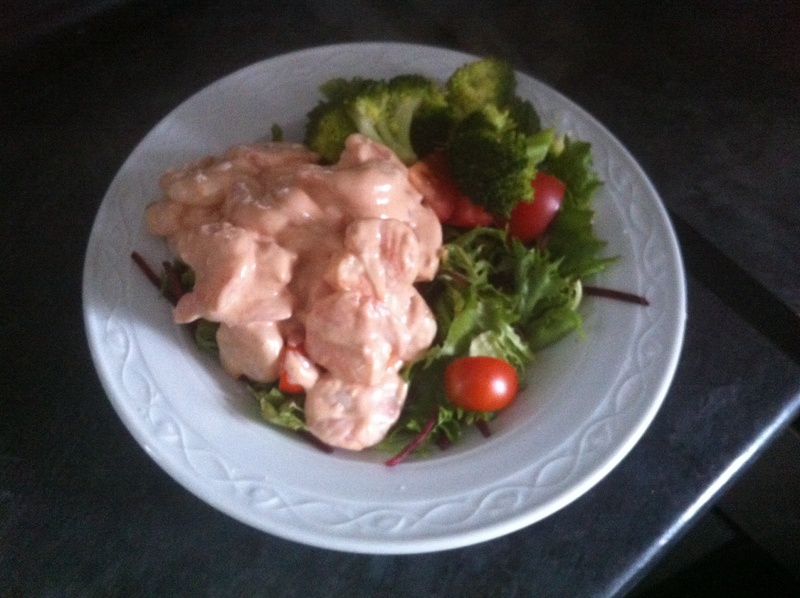 I made my own Marie Rose sauce (2tbsp mayonnaise, a teaspoon of tomato puree and a dash of Tabasco), and mixed this with 100g king prawns. I served this with salad and steamed broccoli. I also had some dry-roasted peanuts. I had one and half turkey steaks, diced with a cream sauce. The sauce was made from mushrooms fried in a little butter. I added a tablespoon of wholegrain mustard, 250ml double cream and some salt. (I used about a quarter of this sauce.) I served it with steamed cauliflower and salad. 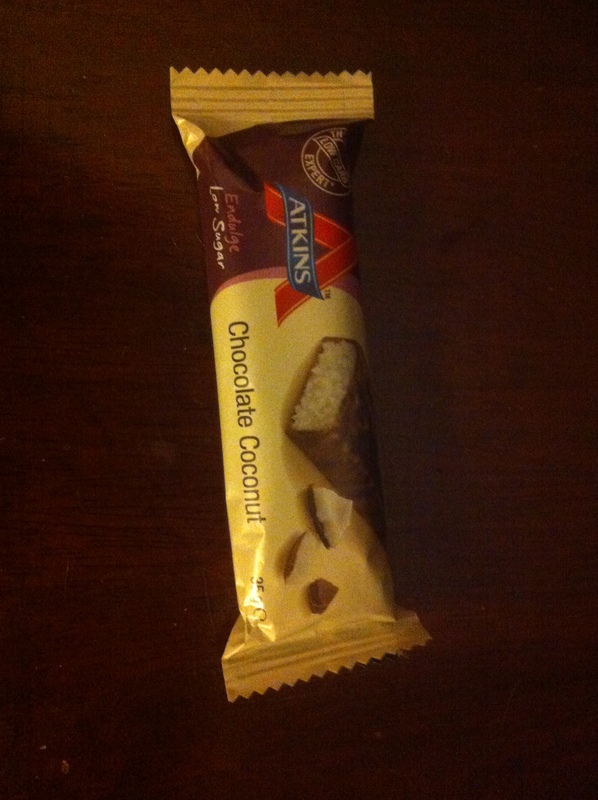 I finished with an Atkins bar – the chocolate coconut one that’s a bit like a Bounty bar. These bars are controversial in low-carb circles. They are heavily processed, after all. However, I really love the coconut chocolate one and I count 8g of carbs per bar, not the 2g of net carbs the label claims*. *You need to figure this out yourself. The nutritional information for the Atkins bar subtracts polyols (the sugar alcohol used as a sweetener) from the total to give you the net carb content, but some people find polyols do affect their blood sugar levels.